Observation - Young fox - UK and Ireland. Description: Young fox. 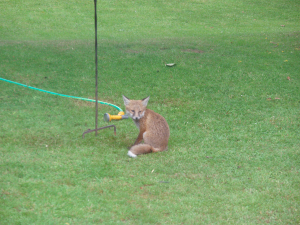 Spent a long time gnawing at the grass under the bird feeder. What was it after? Sunflower seeds? Young fox. Spent a long time gnawing at the grass under the bird feeder. What was it after? Sunflower seeds?